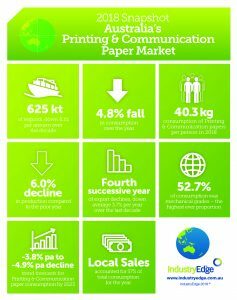 Australian demand for Printing & Communication papers fell 4.8% in 2017-18. This grade of paper includes everything from copy paper, to magazines, brochures, leaflets and catalogues delivered into letterboxes. Trend forecasts suggest – based on three different scenarios – that demand will decline between 3.8% and 4.9% per annum through to 2023. The relatively similar trend forecasts are notable because they are based on historical consumption data going back between two and ten years. The infographic shows some of the headline facts from the Printing & Communication paper section of the 2018 Pulp & Paper Strategic Review, available now from IndustryEdge. You may download the infographic in PDF format here, and you are free to use it, with appropriate attribution.